Hoodline continues to serve as a reliable source of neighborhood news for San Francisco and Oakland, but it’s also been building tools that help other publications supplement their local coverage. Earlier this year, the company launched a news wire that automates the creation of local news stories using online data sources like Yelp and Zumper. Now it’s also releasing a content recommendation widget that’s similarly focused on local news. The stories being recommended come from several different sources — the individual publisher (in fact, they can limit the recommendations to their own articles if they want), the Hoodline Local Data Wire and the broader network of publishers. 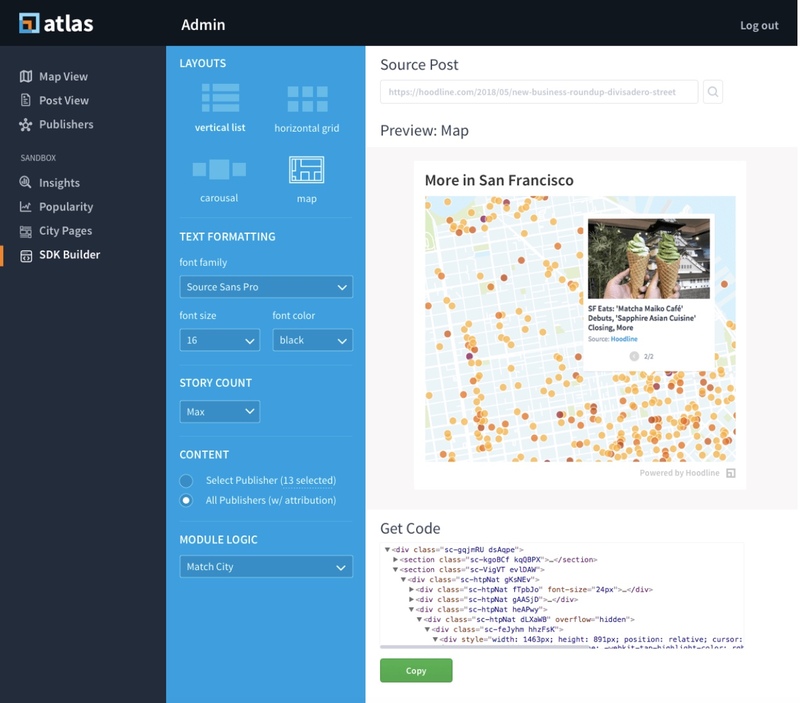 Whatever the source, CTO Shwetank Kumar said Hoodline’s Atlas platform can automatically tag articles with things like geolocation and sentiment. So when the module shows up next to an article, it can recommend other stories that are locally relevant and have a similar topic and tone. By limiting recommendations to local news from the Hoodline network, the company should be able to avoid most of the clickbait filling up other content widgets. In addition, Head of Product Melissa Mazman said Hoodline is trying to “strike a balance” by surfacing content that people actually want to read without prioritizing clicks at the cost of quality or other engagement metrics. Hoodline says that in the initial tests, the module resulted in an average clickthrough rate that was more than double those of existing products.You can actually judge the recommendations side-by-side with Outbrain on the websites of local ABC TV stations (Hoodline participated in the startup accelerator run by ABC’s parent company Disney). For example in this story about a taqueria fire in Houston, Outbrain’s recommendations appear on top, while Hoodline powers the “More from Houston” headlines. By the way, I should note that Hoodline’s editorial team is led by former TechCrunch co-editor (and my longtime friend) Eric Eldon. The startup was acquired by Ripple News (now known as Pixel Labs) in 2016, and since then, Hoodline has become the brand for all of the company’s consumer-facing products.